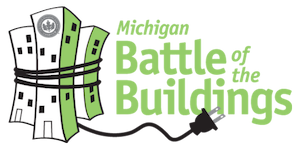 The Michigan Battle of the Buildings competition uses EPA’s Energy Star Portfolio Manager to benchmark energy (required) and water use (optional). Portfolio Manager is an online tool used to track the performance of one building or a whole portfolio of buildings. Energy use is measured in kBtu’s. This data comes from utility bills and that are entered in Portfolio Manager. The calculated kBtu is then divided by the building’s square footage. The result is the building’s Energy Use Intensity (EUI). To calculate the energy percentage difference over the competition year, the weather normalized EUI from the previous year is subtracted from the weather normalized EUI of the current year. The calculated difference is how we determine the biggest losers. Water use is measured in gallons. This data comes from water bills and that are entered in Portfolio Manager. The calculated number of gallons used is then divided by the building’s square footage. The result is the building’s Water Use Intensity (WUI). To calculate the water percentage difference over the competition year, WUI from the previous year is subtracted from the WUI of the current year. The calculated difference is how we determine the biggest loser.